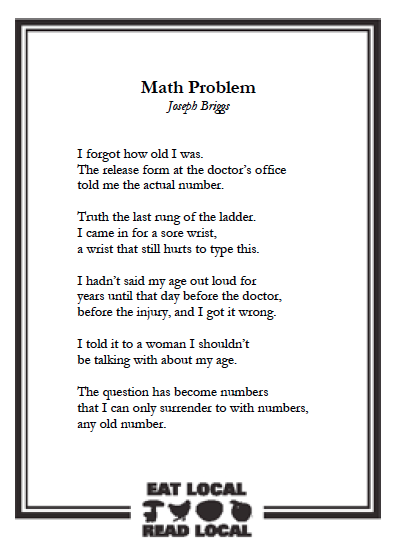 JOSEPH BRIGGS is a poet and photographer who has lived in Madison for eight years. His photography has been included in gallery shows at the Overture Center, and his poetry has appeared in numerous Wisconsin-based journals as well as in publications based out of the UK. His first chapbook, “Paper & Bone” is scheduled to be published in 2015. 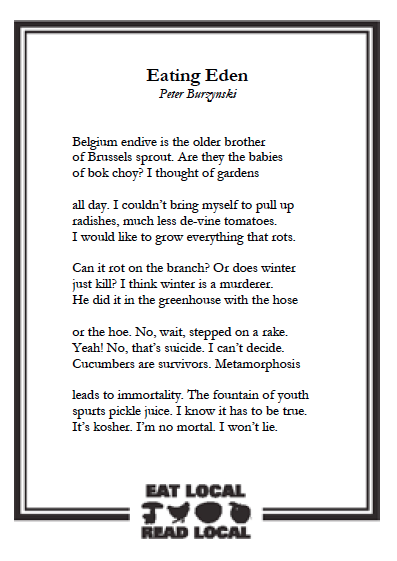 PETER BURZYNSKI is a second-year PhD student in Creative Writing-Poetry at the University of Wisconsin-Milwaukee. He holds a B.A. from the University of Wisconsin-Madison, a M.F.A. 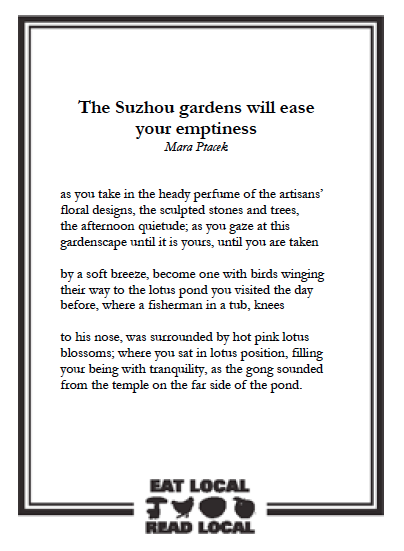 in Poetry from The New School University, and a M.A. in Polish Literature from Columbia University. In between his studies, he has worked as a chef in New York City and Milwaukee. His poetry has appeared or is forthcoming from The Best American Poetry Blog, Thrush Poetry Review, Your Impossible Voice, RHINO, and Forklift Ohio, amongst others. 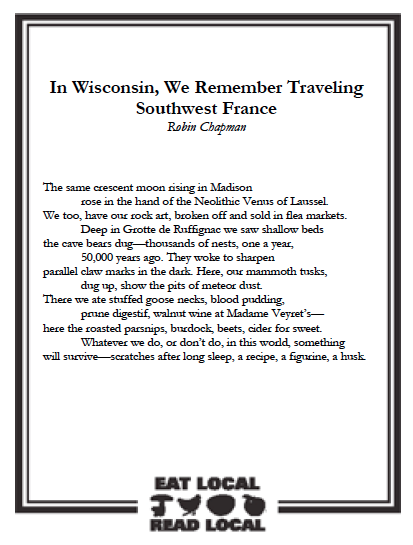 ROBIN CHAPMAN is author of nine books of poetry, including the two Posner Poetry Award-winning collections The Way In and Images of a Complex World: The Art and Poetry of Chaos (with J.C. Sprott’s explanations and fractals) and The Dreamer Who Counted the Dead, which received a Wisconsin Library Association Outstanding Poetry Book of the Year Award. Her book Abundance received the Cider Press Editors’ Book Award. Dappled Things (Paris: Revue K), the eelgrass meadow, and One Hundred White Pelicans (Tebot Bach) are her most recent collections. 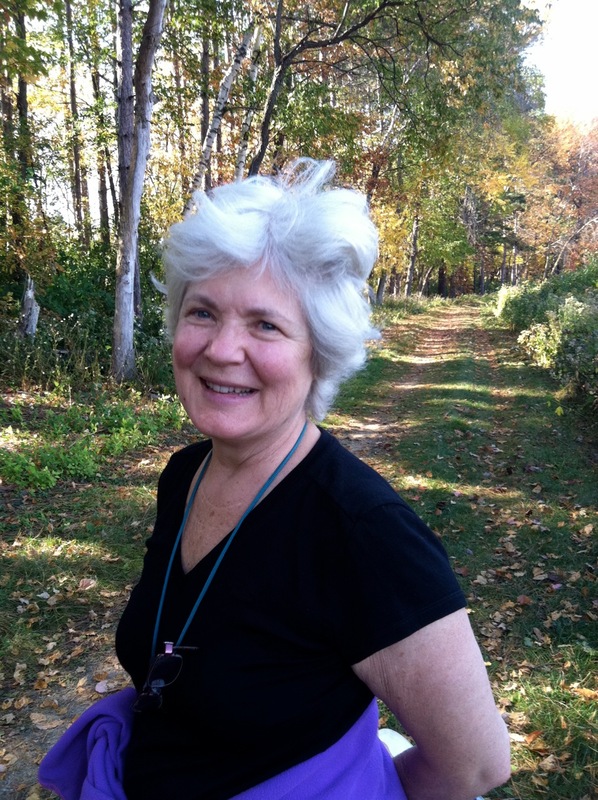 She has also co-edited the anthologies On Retirement (University of Iowa Press) and Love Over 60: An Anthology of Women’s Poems (Mayapple Press). Robin has collaborated with composers, painters, textile artists and scientists in producing work. 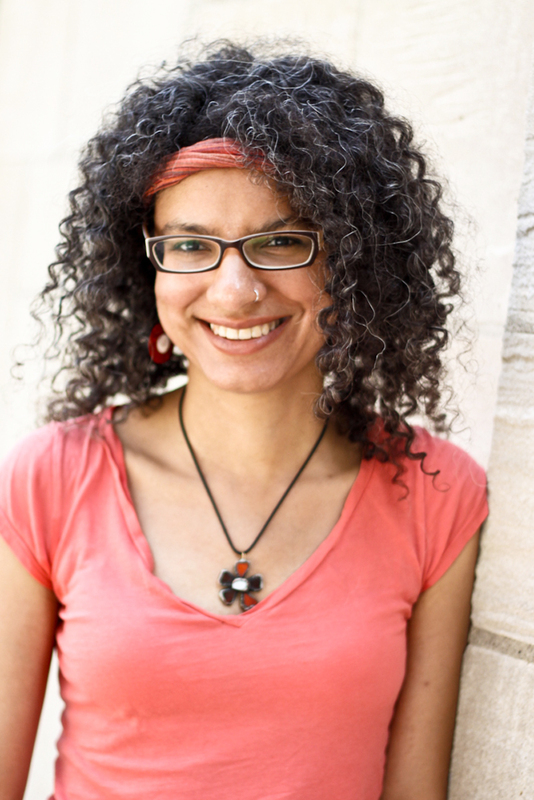 Her poems have appeared recently on The Writer’s Almanac, American Life in Poetry, and Verse Daily; she is the recipient of the 2010 Appalachia Poetry Prize. She posts her watercolors, and other poets’ poems, on Robin Chapman’s Poem a Day Blog. She lives in Madison and gardens in Eagle Heights Community Gardens. 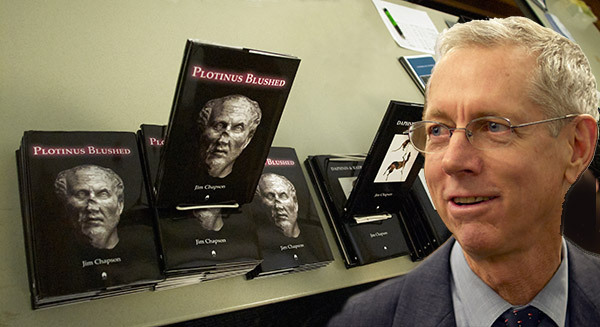 JIM CHAPSON was born in Honolulu, educated at San Francisco State University, and has taught writing at UW-Milwaukee since 1976. FRANKLIN K.R. 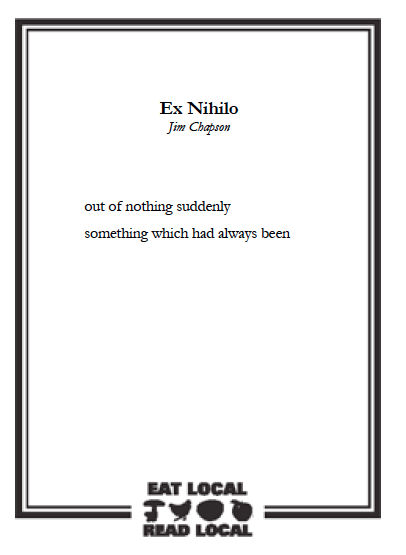 CLINE’s poems have been featured in Banango Street, Matter, Oyez Review and Word Riot. He is an enrolled member of the Cherokee Nation and a PhD candidate in Creative Writing at the University of Milwaukee-Wisconsin. He lives in Milwaukee with three cats and his wife, Rachel Kincaid. 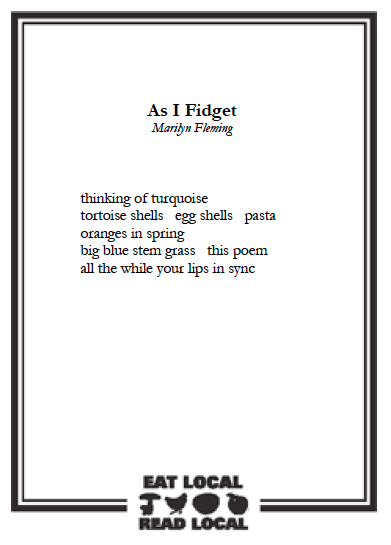 Born and raised on a dairy farm in Wisconsin, MARILYN FLEMING’s poetry has been published in various literary journals, and anthologies, including Wisconsin Poets’ Calendar, Modern Haiku, Red Cedar Review, British Haiku Society’s Blithe Spirit, and Lake City Poets. She has a special interest in Asian forms of poetry and won her first prize in the Hildegarde Janzen Oriental Forms Award in 1988. 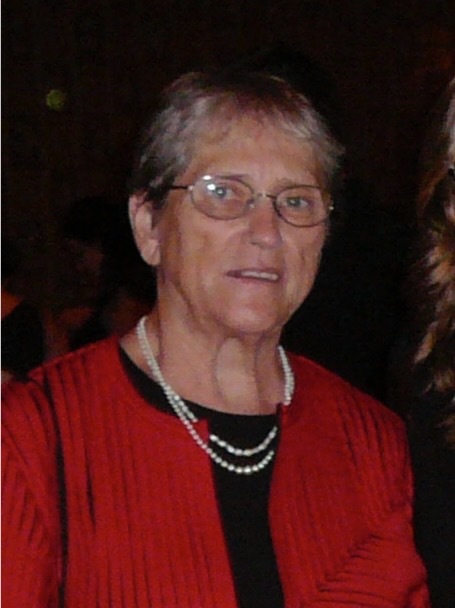 MARGARET NOODIN received an MFA in Creative Writing and a PhD in English and Linguistics from the University of Minnesota. She is currently an Assistant Professor at the University of Wisconsin-Milwaukee where she also serves at the Director of the Electa Quinney Institute for American Indian Education. 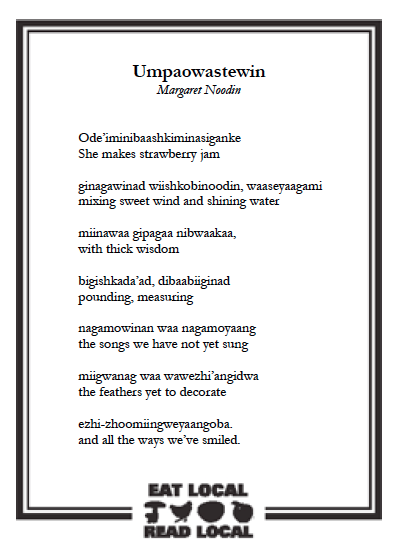 She is the author of Bawaajimo: A Dialect of Dreams in Anishinaabe Language and Literature and Weweni, a collection of bilingual poems in Ojibwe and English. Her poems and essays have been anthologized and published in Sing: Poetry from the Indigenous Americas, The Michigan Quarterly Review, Water Stone Review, and Yellow Medicine Review. With her daughters, Shannon and Fionna, she is a member of Miskwaasining Nagamojig (the Swamp Singers) a women’s hand drum group whose lyrics are all in Anishinaabemowin (Ojibwe). To see and hear current projects visit www.ojibwe.net where she and other students and speakers of Ojibwe have created a space for language to be shared by academics and the native community. MARA PTACEK had the privilege of growing up on a Wisconsin farm in the foothills of the Southern Kettle Moraine where she spent many hours gardening and helping with the harvests. At an early age she knew the meaning of “Eating Local.” From that idyllic place she moved to a wooded area in Franklin, WI, where she raised her family and taught French and English at the local high school. 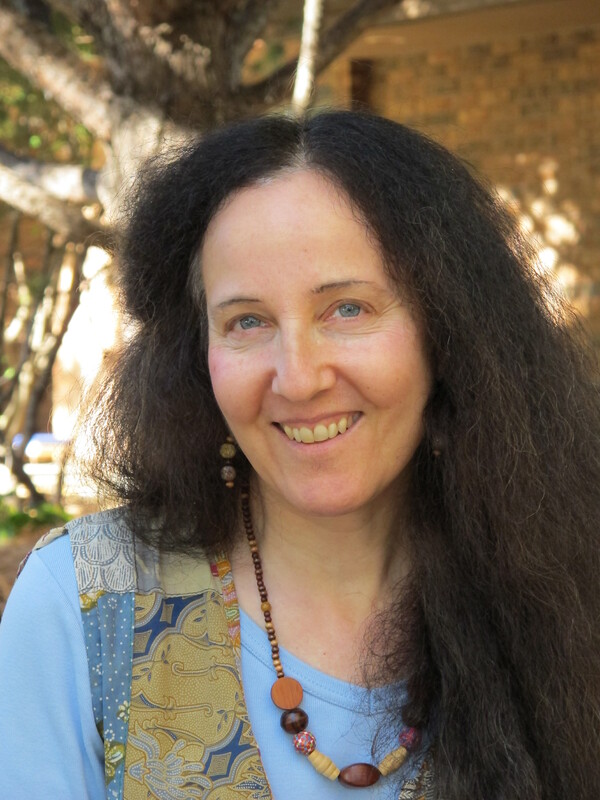 She has written poetry for many years and belongs to a poetry group called “The Sparks.” Currently, she is looking for a home for her poetry manuscript, “Zen in a World of War,” and working on “Scent of Red,” a chapbook of apple poems. 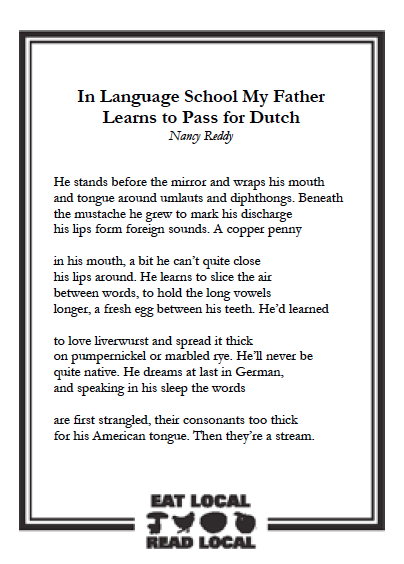 NANCY REDDY is a doctoral candidate in Composition and Rhetoric at the University of Wisconsin-Madison, where she also earned her MFA. 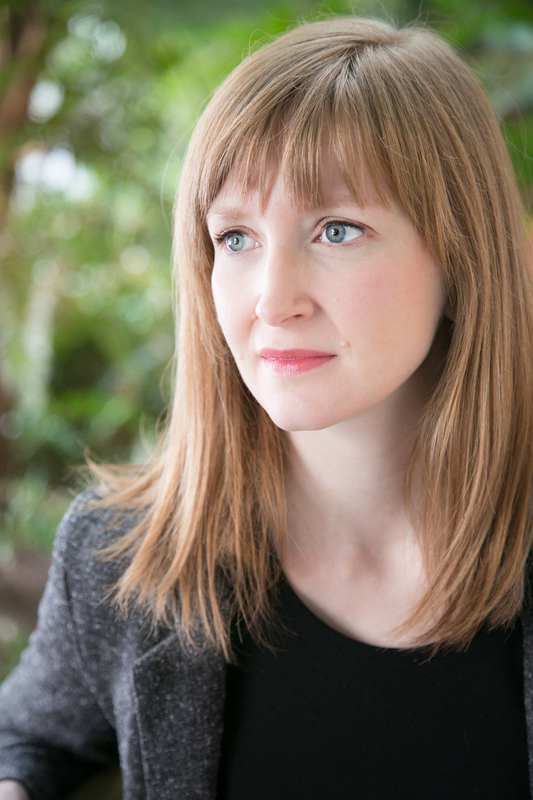 Her first book, Double Jinx, was recently selected as a winner of the 2014 National Poetry Series and is forthcoming from Milkweed Editions in 2015. 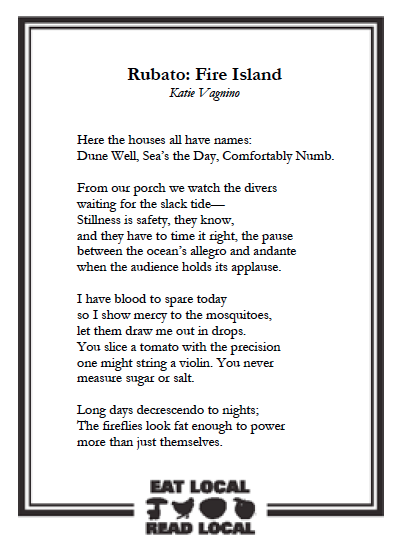 Her work has most recently appeared in 32 Poems, Tupelo Quarterly, Smartish Pace, and elsewhere. 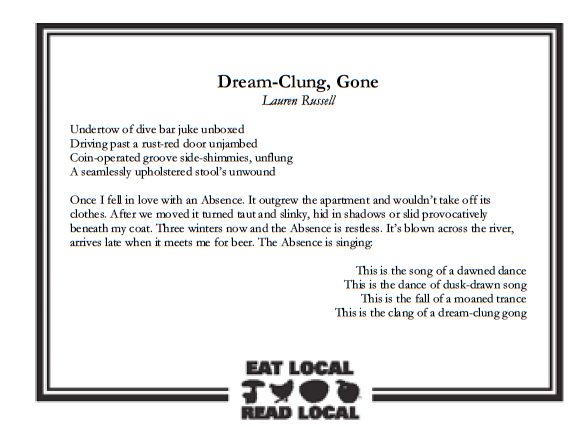 LAUREN RUSSELL’s second chapbook, Dream-Clung, Gone, came out from Brooklyn Arts Press in 2012. Her poems have appeared in various print and online publications, including Better, Eleven Eleven, and jubilat, among others, and are forthcoming in boundary 2. Her reviews may be found in Aster(ix), Jacket2, The Volta, and elsewhere. 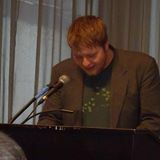 Russell holds an MFA from the University of Pittsburgh and is the 2014-2015 Jay C. and Ruth Halls Poetry Fellow at the Wisconsin Institute for Creative Writing. 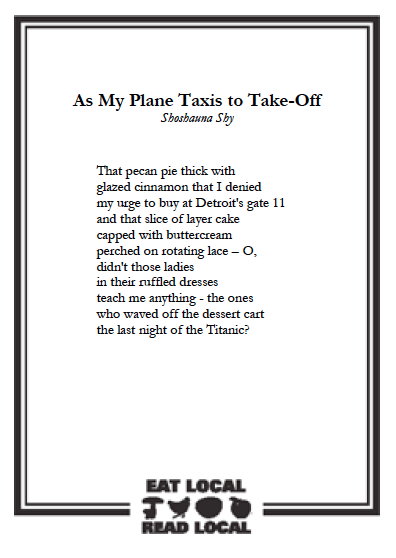 SHOSHAUNA SHY heads up the Poetry Jumps Off the Shelf program out of Madison, Wisconsin with the mission of bringing poetry to the general public in unexpected ways. 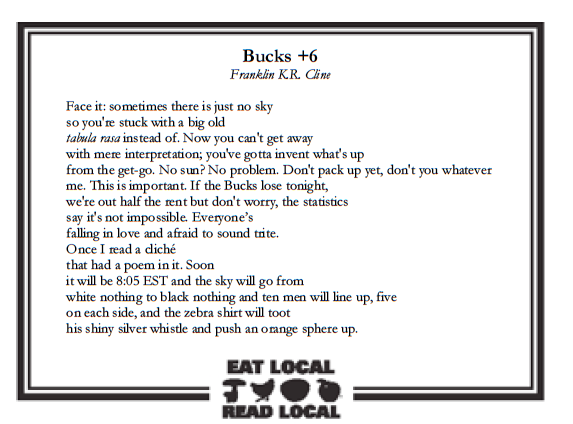 Poems by poets world-wide have been produced on java jackets, bookmarks, postcards, decals, attached to bicycles, maple syrup bottles, and spilling out of jawbreaker machines. More about this program can be found here: www.PoetryJumpsOfftheShelf.com. Poetry saturates the rest of her life, too. 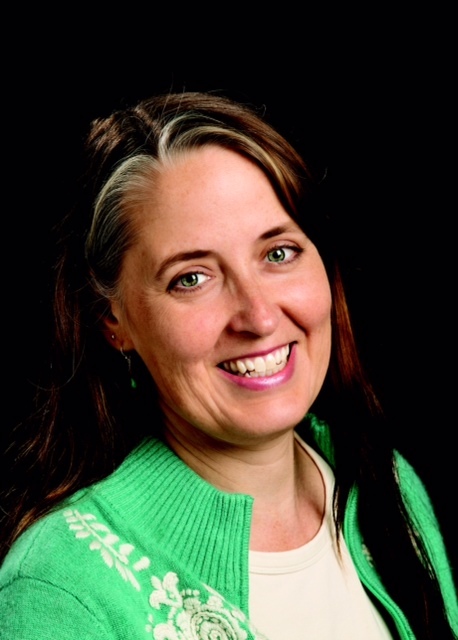 She works for the Wisconsin Humanities Council which helps to fund literary projects (as well as museum exhibits, documentaries, theatre productions, and other programs). 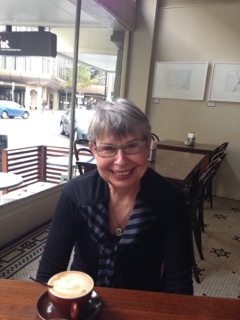 Her poems can be found online in recent issues of Carbon Culture Review, Mason’s Road, Apple Valley Review, First Class Lit and Postcard Poems & Prose. Her 4th collection titled What the Postcard Didn’t Say received an Outstanding Achievement Award from the Wisconsin Library Association. 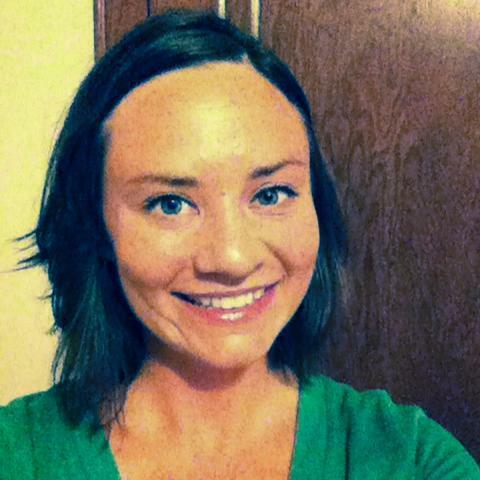 KATIE VAGNINO is a poet, educator, and freelance writer originally from St. Louis, MO. She earned her MFA from Emerson College in 2011. Currently she is a Visiting Assistant Professor at the University of Wisconsin-Eau Claire, teaching creative writing and composition. Her poetry has appeared in a number of print and online journals including Measure, The Raintown Review, Poetry Quarterly, and Words Apart (which recently nominated two of her pieces for the 2015 Best of the Net Anthology). For more information, please visit www.katievagnino.com. LINDSAY DAIGLE is a PhD candidate in poetry at the University of Wisconsin Milwaukee, where she also teaches undergraduate writing and literature. She holds an MFA from The New School. She’s interested in the poetics of place, space, and melancholy; the ekphrastic process; as well as the intersections between creative writing and composition pedagogies. Her work has appeared or is forthcoming in Barn Owl Review, Quarterly West, The Laurel Review, and elsewhere. 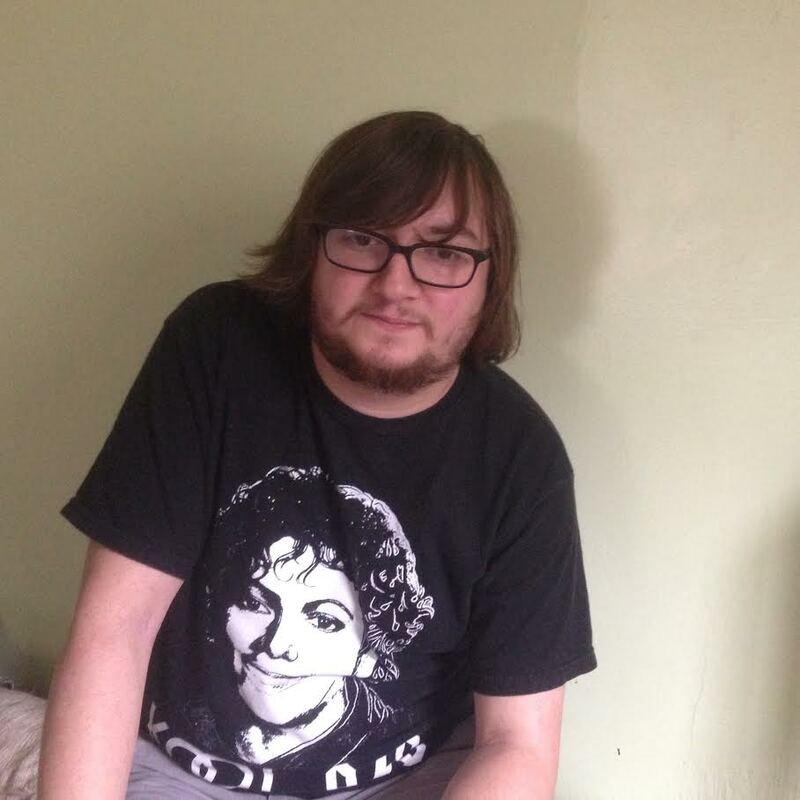 TOBIAS WRAY is a poetry editor for the cream city review. His work has appeared or is forthcoming in Third Coast, Bellingham Review, North American Review, The Fourth River and elsewhere. He’s been a finalist for the Black Warrior Review Poetry Contest and the Wisconsin Institute for Creative Writing Fellowship. 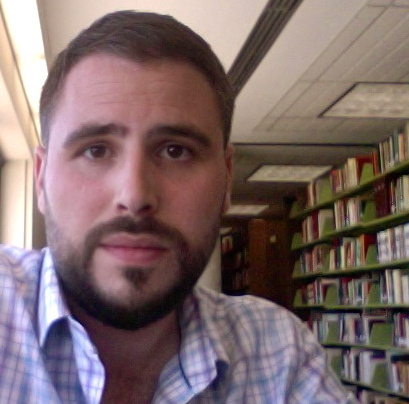 He holds an MFA in poetry and translation from the University of Arkansas and is a doctoral candidate at the University of Wisconsin-Milwaukee.